Kimchi, the Korean fermented vegetables with red chile, add a pungent, spicy kick to roast chicken and potatoes in this recipe from Bon Appetit March 2013. This recipe uses the best method to pan-roast chicken thighs. Bone-in, skin-on chicken thighs are placed in a frying pan skin side down until the fat renders and the skin is golden and crispy. The thighs then finish cooking through by roasting in the oven along with the potatoes and kimchi. The whole dish is finished with arugula and a simple vinaigrette made from the kimchi pickling liquid, rice vinegar, and oil. A good, simple, weeknight dish. 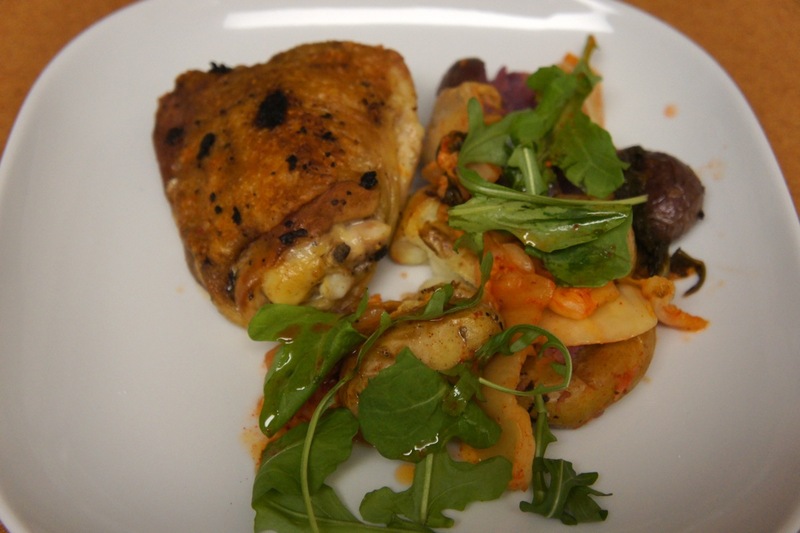 Leftovers are not as good as just-cooked, because the texture of the chicken changes. It’s been a while since I made something new from the Momofuku Milk Bar cookbook. The recipes I have made multiple times are the Ritz Crunch, the Chocolate Chip-Marshmallow-Cornflake cookies, and the Crack Pie. Recently I finally made the corn cookies, and they are delicious, with a buttery, rich, salty-sweet corn flavor. The recipe is really easy, but there are two specialty items to track down, which is what took me so long to make these cookies. The first is freeze-dried corn. Not available in Bay Area grocery stores as far as I can tell. I had to order online through Amazon. One 8 oz bottle was enough for two batches of cookies. The freeze-dried corn is easily pulverized to a powder in a blender. To this is added corn flour, which I found at an Asian grocery, Ranch 99. Corn flour is a finely ground corn meal, ground from the whole corn kernel. The remainder of ingredients are common. I would love to try these cookies with corn ice cream in the summer. Link to recipe here. Link to Momofuku Milk Bar cookbook here.